You’re stuck in traffic and can’t see ahead of you. You need a closer look at your boyfriend and the mystery woman at a restaurant and use thermal imaging at an apartment complex after dinner. Or you’re engaged in urban combat and need an eye in the sky to spot Zarqawi’s men with infrared sensors. Then, you need a MAV, a Micro Air Vehicle that flies at 58 miles per hour, stores and relays video, and can “hover and stare” from a safe distance. Wouldn’t you want one for Christmas?Honeywell is giving the U.S. military a buy-one-get-one-free deal. 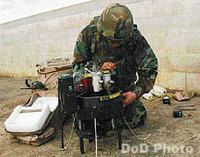 Each “backpackable” unit contains two Micro Air Vehicles and a ground station. The MAV, which uses a ducted fan for vertical takeoff and movement, can fly for an hour and reach 10,500 feet. The concept was born at the Defense Advanced Research Projects Agency, better known as Darpa, to allow mobile units to carry their own unmanned aerial vehicle [UAV] on their missions. The photo in Honeywell’s brochure (PDF file) shows four little MAVs flying all over an open terrain in a scene reminiscent of futuristic sci-fi movies. But these insect-looking creatures are not pretty and have no glowing eyes. It apparently comes in black, as seen in the recent U.S. Army photo. After more than 200 flight tests, soldiers from the 2nd Battalion, 5th Infantry Regiment used a Honeywell MAV in a training exercise in Hawaii. The components look hard to put together — especially when taking enemy fire. All this is part of the U.S. Army’s Future Combat Systems, a program to modernize the military with unmanned, high-tech gadgets that are linked by a single network. It will eventually include armed robotic vehicles and unmanned helicopters. Graphics in the white paper look like combat elements from a gaming software. Boeing Integrated Defense Systems, DoD’s LSI for FCS, expects MAV to become the Class I UAV for FCS. 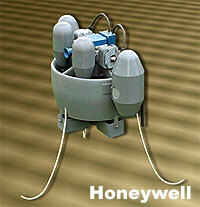 Honeywell International, Defense and Space Electronics Systems, Albuquerque, N.M., is being awarded an undefinitized modification to a previously awarded other transaction for prototypes agreement to add the Micro Air Vehicle Advanced Concept Technology Demonstration effort to the on-going Organic Air Vehicle program.